In the national GP Patient Satisfaction Survey 2018, The Dorchester Road Surgery achieved an overall satisfaction score of 98% (top 10 for all surgeries in Dorset). We are very proud of this achievement. Thank you to our staff and thank you to our lovely patients who participated in this survey. 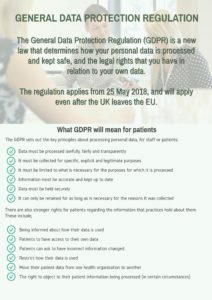 Data protection and the diabetic eye clinic.